It may still be summer (just about) but fall is on the way and before we know it, it will be Christmas. For some of us, the autumn usually goes by fast and contains intense periods of work. More often than we would like, we realize that it is October already, the deadline is next week and the holidays seems to be approaching unusually fast this year. And, when it comes down to it, it is during these hectic and stressful times when multiple deadlines are approaching simultaneously that both the quality of what we need to deliver and our energy levels suffer. If we want to be ahead of ourselves and on top of our game, then this is the time to make sure we get to work with better foresight throughout the autumn – at least in terms of events, tasks and deadlines we are able to predict. I assume you also have a number of activities, due dates and deadlines throughout the next few months that ‘stick out’. These may be in addition to your normal day-to-day, and which you need to spend a bit of extra energy on. They can therefore be regarded as mini milestones leading up to the holidays. In the everyday humdrum of all those little, quick tasks we need to do regularly, it is easy to postpone those larger and more extraordinary tasks for later. Until after that one urgent thing that just fell into your lap, and we keep thinking “I still have plenty of time” – until we no longer do. Clarify the milestones you know are coming your way in the next few months and get an overview of when they will occur right now, at the beginning of the season, giving yourself better foresight. You will be better prepared for them (and less surprised as they approach) because you then can make sure to regularly define what next steps and tasks you need to take and do in working towards accomplishing them. 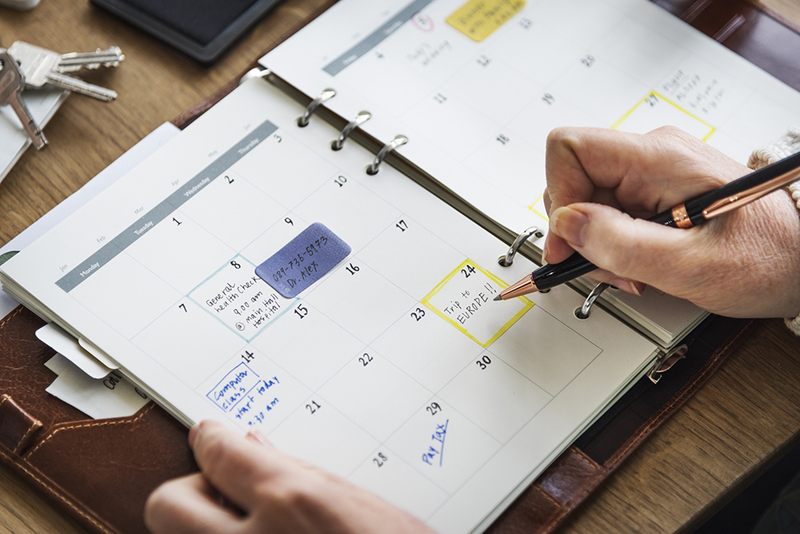 Look through your calendar for those major events or tasks you might regard as milestones coming up between now and Christmas. Make note of them somehow (I made a list in an empty document just to make it as simple as possible). If you haven’t already, enter these milestones as projects on your overview of projects and more extensive tasks. Write the first step of each and every project as a task and add it to your to-do-list. Write up any other steps you can think of that you will need to take. You do not have to give them due dates if you either do not want to or do not know when they need to be done, but if you still want to be certain of what steps to take throughout the process you might as well create the tasks now. You will now either decide on when you will do every first step you just defined, or you can trust that you will spot any uncompleted tasks as you are browsing through your projects every week, looking for tasks to activate, meaning giving it a due date to ensure that it gets done. You have now prepared yourself a bit more for what’s to come, and you can get started on doing those larger tasks due later this fall now and feel great knowing that you are well ahead of schedule. You are more likely to get stuff done on time or with time to spare, since you have made it possible to at frequent intervals remind yourself to take small, concrete steps in the right direction.